Organizations use 360 feedback profiles to provide personalized feedback to their leaders. Unfortunately, these reports can become overly expensive, extremely time consuming and many require certifications to use. 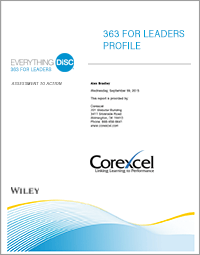 Everything DiSC 363® for Leaders is a cutting-edge, online 360 feedback profile that combines the detail of a typical 360 profile with the simplicity and power of DiSC®. The result is an assessment that is detailed, valid and reliable. You will also find that it is extremely easy to understand. Colleagues, or raters, anonymously rate one of your organization's leaders across 72 leadership behaviors using our confidential online profile system. In addition to rating behaviors, participants can choose from a pre-selected list of comments. The comment and ratings are combined to generate a comprehensive 360 feedback report. The convenience of the Internet, combined with our pre-selected commenting system, saves time while keeping the information simple and organized. Traditionally 360° feedback tools are extremely time consuming and can create uncomfortable situations in the workplace. Everything DiSC 363 for Leaders minimizes these problems with its clear visuals and conversational style. This makes the profile easy to use and understand. Our revolutionary approach to the 360 feedback profile includes the use of CommentSmart, our exclusive selectable comments feature where raters choose from pre-written, fully validated comments. This allows your raters to provide feedback that's reliable, balanced and constructive. We've worked hard to only include comments that avoid negativity but provide detailed feedback that is both useful and actionable. In addition to the 360 feedback profile every customer gets a complimentary 363 Coaching Supplement that provides an overview of the leader's performance scores along with their DiSC behavioral style. 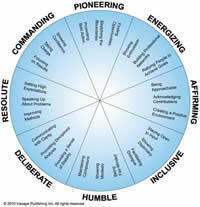 Everything DiSC 363 for Leaders is great feedback profile for anyone regardless of profession or skill level. If you, or your organization, is interested in using a 360˚ profile to generate feedback as part of leadership development, consider trying our exciting new approach to 360˚ feedback. The links below open our free 360 sample reports in .pdf format. Please make sure your pop-up blocker is disabled because the sample reports open in a new window. For more information visit our EPIC online accounts page. If you already have an EPIC account order additional credits using our EPIC Order Form. For additional information about our new 360 Feedback Profile, Everything DiSC 363 for Leaders, please call 1-888-658-6641 during normal business hours, 9:00 am - 5:30 pm EST, M - F or send you request using our contact form. "DiSC" and "Everything DiSC 363" are registered trademarks of John Wiley & Sons, Inc.